have i ever made a different game in my life? wearing the trappings of a videogame. but it's frightening to see how formulaic that form truly is. this game has no sound. that's not a bug. it's not a feature, either. i recommend listening to something appropriate in the background, but it's up to you. Had a few goes at this and at first couldn't figure it out, but then it grew on me. It was surprisingly creepy. Anyway looks nice and enjoyed the challenge. aww dang, I got stuck in a wall and I am pretty sure it wasn't intentional :( was falling inbetween screens. Can send you a screenshot if you want. Really cool concept. 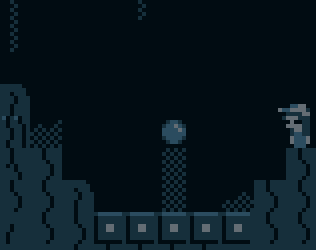 Loose platforming controls made it a bit for frustrating than it had to be, but the tradeoff was it made you really pay attention to the level design and plan a route. That was an interesting mechanic. The ghost were truly a nightmare! I love your platforming maze games with unique touches! This is hell. I just want my orbs, but they keep getting taken from me. Orb hell. I went right in Level 3's second screen and got thrown into something that seems to be a level editor? an unfortunate bug. thx for catch.